An important center for the Northeast of Thailand, the city of Khon Kaen is one of the four major cities of Isan, Thailand’s largest region. A relatively new city, Khon Kaen has an almost sophisticated feel that’s different to many destinations in the country and features museums, cultural centers, parks, a university, and of course wats. If you’re keen to explore somewhere different in Thailand, and maybe to use it as a hopping point into Laos or Vietnam, Khon Kaen is recommended. Khon Kaen is situated about 450 kilometers (280 miles) to the north-east of Bangkok and is well connected to the capital by several highways, a train, and flights. Trains and buses take roughly the same amount of time, while the quickest way to get to Khon Kaen from Bangkok is easily by catching a flight. Interestingly, because there are several different airlines offering this route, including budget carriers, you can fly from Bangkok to Khon Kaen for a very reasonable price, but we’ll discuss that later. Keep reading to hear more about ticket prices and options. Hua Lamphong Train Station in Bangkok. Easy to reach with MRT. The subway station has the same name. 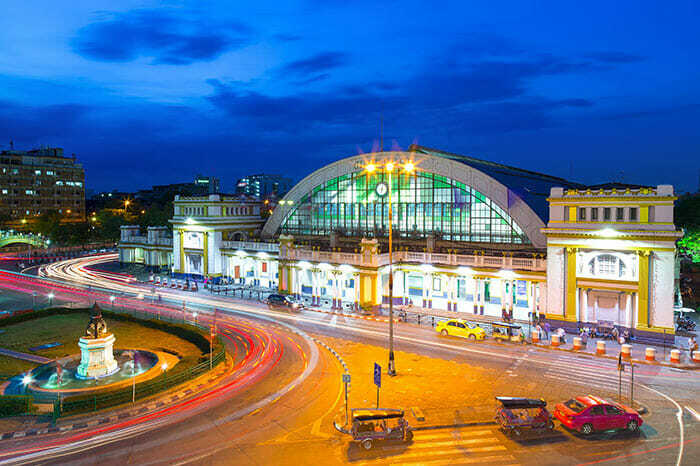 Thai Railways provides three departures per day from Bangkok’s Hua Lamphong Station, and with each departure you will usually have a choice of cabins, depending upon ticket availability. If you would like to travel through the day, hence making the most of being able to see the passing scenery, towns and cities, catch the early morning train from Bangkok which departs at 08:20. The scheduled travel time is 7 hours and 15 minutes, which gets you into Khon Kaen when it’s still daylight, leaving you some time to explore and find a hotel. The next option is an early evening departure, from Bangkok at 18:35 and arriving in Khon Kaen at 02:05. You could argue that if you travel this way you’re not wasting a lot of valuable daylight hours, but, you’ll be arriving in Khon Kaen at an unsociable hour so it would probably be best to have figured out your accommodation beforehand, and a way of getting from the train station to your hotel as choices will be limited at this hour. The final train option goes from Bangkok to Khon Kaen at 20:00 and arrives around 04:18. With this train you have the option of purchasing a sleeper cabin, so you can get some rest and avoid having to pay for a night in a hotel. Arriving so early in the morning could present a few challenges as you may have to wait around at the train station for the city to wake up, but at least you’ll be there bright and early and ready to start a day of sightseeing. On the sleeper trains there are options for different carriages, including a 2nd Class sleeper, a 1st Class sleeper, and a Ladies Only sleeper. If you like to travel overland, then your second transport choice is by bus. The tour operator, Chan Tour, provides multiple departures every day from their office in the Chatuchak area of Bangkok, the first leaving at 05:45 and the last bus of the day leaving at 22:00. In between, there are around 20 different buses you could catch, so in terms of flexibility this is a great option that you should be able to fit around any schedule. Chan Tour’s VIP buses are well equipped for a comfortable journey with air conditioning, snacks and food service, a steward, and there are TVs and toilets onboard. The travel time is quite long though, at roughly 7 hours and 20 minutes, so bear this in mind if you’re considering a later departure from Bangkok, as you will arrive in Khon Kaen in the early hours of the morning. 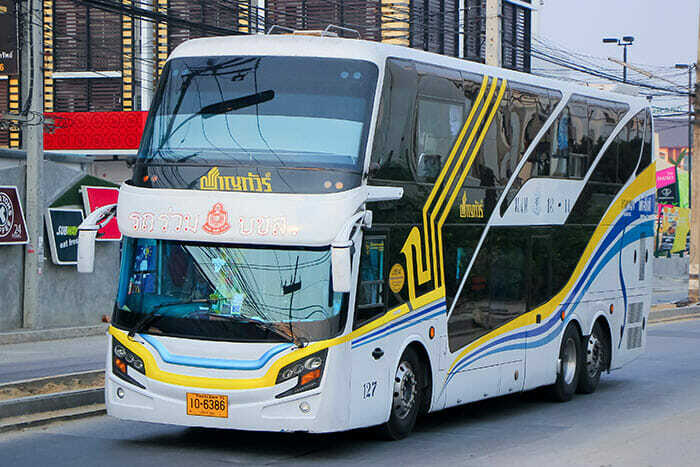 The biggest advantage of traveling from Bangkok to Khon Kaen by bus is the price, this is easily the cheapest way to get from one city to the other so it’s the perfect option for people who are trying to stick to a tight budget. Usually flying would be the most expensive way to get from A to B, but with flights from Bangkok to Khon Kaen, this isn’t necessarily the case. To start with, there is good competition between airlines for this route which helps to keep prices lower, and among those airlines are budget carriers, so there’s a real opportunity to get a great deal on a ticket. 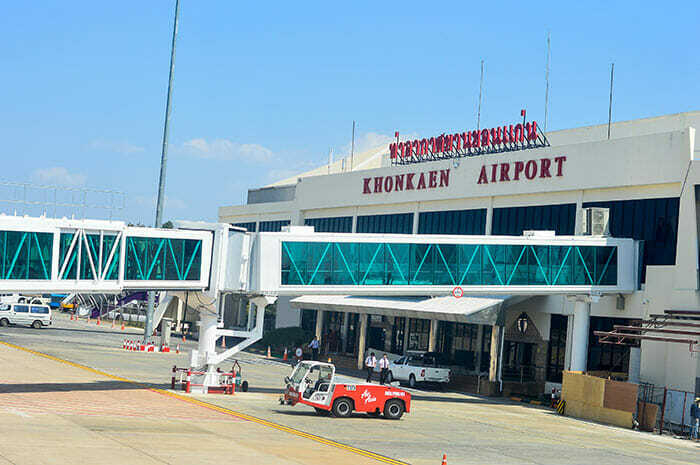 Most flights depart from Bangkok’s Don Mueang Airport and arrive at Khon Kaen Airport, which is about 20 minutes outside of the city center. You can fly this route with Nok Air, Thai Lion Air, and Thai AirAsia. The latter offers more flights than Nok Air, definitely do shop around when looking at these options. You could also consider flying from Bangkok’s Suvarnabhumi Airport with Thai Smile. Flights are around 1 hour, so it’s extremely fast compared with traveling by bus or by train, and, if you get one of those cheaper tickets, the cost is not too dissimilar to traveling by train anyway. Choosing which is the best way to travel from Bangkok to Khon Kaen is not as cut and dried as you might think. The budget-conscious traveler will no doubt choose the bus because this is easily the cheapest way to travel, but when trains and flights are similarly priced there’s bound to be more people catching a flight to Khon Kaen because of the time it will save. However, traveling by train in Thailand is quite an experience, and if you’re going through the day you’ll get to see the scenery, so really it will come down to your personal preference!